The first workhouse at Prescot dates from 1707 and was founded by Oliver Lyme in rented almshouses on the Prescot to Rainhill Road. Halewood had a workhouse from 1723, while others were opened at Huyton, Sutton, and Moss Bank in 1732, at Bold in 1734, and at Speke in 1742 (Hitchcock, 1985). A parliamentary report of 1777 recorded workhouses in operation in Prescott (for up to 80 inmates), Allerton(50), Ditton (50), Eccleston (50), Hale (50), Halewood (40), Rainford (15), Speak [Speke] (50), Sutton (30), and Widnes (50). Sutton operated a workhouse at Marshall's Cross in St Helen's, and Windle had one on Ormskirk Street also in St Helen's. Windle's St Helen's workhouse, 1849. 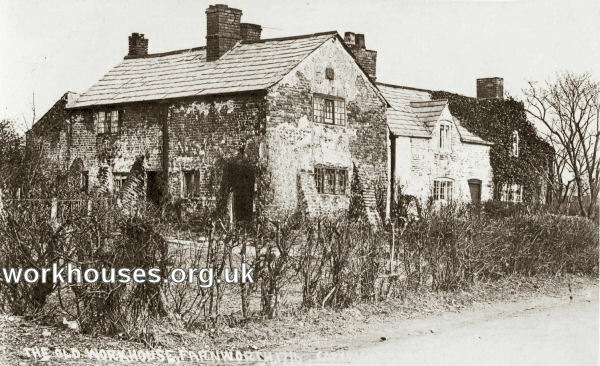 Cronton had a workhouse from 1779 on Cronton Lane. The property, later known as Bear's Paw, is now a private house. Much Woolton and Whiston also ran local workhouses. Lancashire: Bold, Cronton, Ditton, Eccleston (2), Hale, Halewood, Huyton, Knowsley, Parr, Prescot (3), Rainford, Rainhill, Roby, Speke, Sutton (2), Tarbock, Whiston, Widnes with Appleton, Windle (3), Little Woolton, Much Woolton. Later Addition: St Helen's (from 1894). The population falling within the Union at the 1831 census had been 34,160 with parishes and townships ranging in size from Cronton (population 293) to Prescot (5,055). Opposition to the new regime briefly surfaced in St Helen's with the Revd James Furnival attacking its "vigour and cruelty". By 1839, Furnival had clearly had a change of heart, accepting a £50 salary to become the union's chaplain. Initially, the new Prescot Union adopted the existing building at Windle for its main workhouse, with the elderly being placed at the Sutton, and children at Much Woolton. In 1842-3 a new Prescot Union workhouse was built on the Warrington Road at Whiston. Designed by William Culshaw, who was also the architect of workhouses for the Ormskirk, Toxteth Park and West Derby unions, the Prescot workhouse followed the standard cruciform layout developed by Sampson Kempthorne. The workhouse location and layout are shown on the 1906 map below. The front block facing towards the road at the north was rebuilt in 1888. Prescot front block from the north-west, 2001. Prescot central hub and south wing from the south, 2001. In 1876, a T-shaped school block was erected at the southern end of the south wing. Further south was a long infirmary block. An additional infirmary or mental ward block running north-south was located to its east. Prescot school and ward blocks from the south-west, 2001. 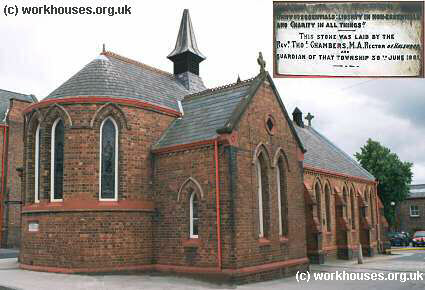 A chapel was erected to the east of the workhouse in 1881. Its foundation stone was laid on 30th June by the Revd. Thomas Chambers, the then Guardian for Halewood. Prescot chapel from the north, 2001. Prescot aerial view from the south, 1920s. From 1904, to protect them from disadvantage in later life, the birth certificates for those born in the workhouse gave its address just as 1 Warrington Road, Whiston. Prescot workhouse later became Whiston Hospital. The main workhouse buildings have now been demolished. 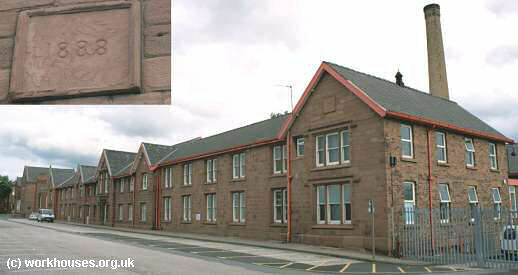 Lancashire Record Office, Bow Lane, Preston, Lancashire, PR1 2RE. Very limited holdings include Guardians' minutes (1837-1930). A History of Prescot Union Workhouse, Whiston, Lancashire by Pauline Hurst (2009). Non-Paypal orders should be sent to: Publications, St Helens Townships FHS, 6 Gainford Close, Widnes, Cheshire WA8 4UN. For any further queries, please contact the Townships FHS via their website (see below).